Our playground consultant, Greg Rossiter, met with Leamington Primary Academy to discuss their plans for the development of their outdoor play areas. Further to the meeting, we installed a fantastic, physical-development trim trail. It offers several challenges for traversing, balancing, climbing and cooperative play. 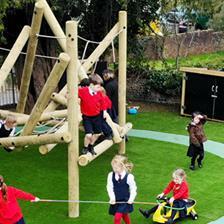 We also installed our largest climbing frame, the ‘Crinkle Crags Climber’, for this exciting development. This bold, exploratory climbing frame provides dozens of crossing and navigating points, creating an entertaining and equally stimulating unit for the children to enjoy. Our huge Crinkle Crags Climber was installed on Playbond Safety Surfacing in a dark green and earth brown mix to create a natural look, which complements the adjoining grass. It also delivers a safe and practical surface, allowing the equipment to be used safely all-year-round. The sturdy Crinkle Crags Climbing Frame is made from a combination of high-pressure treated, playgrade timber and steel reinforced nylon ropes. This giant climbing frame offers oodles of opportunities for physical development at the traversing, climbing and navigating points. As well as developing the gross and fine motor skills in children, it advances balance and overall co-ordination, too. Children are encouraged to use trial and error and cognitive thinking when trying to cross points. It’s a diverse and fun frame, allowing children to work together as a group, or alone, whilst simultaneously encouraging children to communicate with one another. The space beneath is perfect for children to create an imaginary den or a home for time-out and relaxation when taking a break from physical play. Next in line to the Crinkle Crags Climber, a fantastic durable timber Trim Trail is positioned on top of dark green and earth brown mix, playbond, to create a crescent shaped, adventure pathway. This excellent selection of Trim Trail Equipment is fully equipped with apparatus to help children continue their heroic quest. It is a varied and challenging adventure track featuring 14 unalike tasks for children to complete. It is ideal for Key Stage 1 and Key Stage 2 children. The equipment has been carefully selected and designed to allow children to build and advance their upper and lower body strength. The apparatus also requires concentration, coordination, balance and hand-eye coordination, whilst inspiring group-work and self-confidence in children. 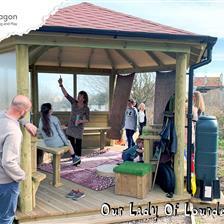 The children and teachers at Leamington Primary Academy are thrilled with their new and improved outdoor play area. 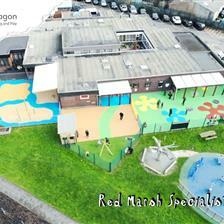 It is now a fun and challenging outlet to help the lively children use some of their pent-up energy. If you are looking to add some excitement into your old-fashioned playground or looking to completely revamp your outdoor play areas with playground equipment designed to support the curriculum, please Contact Us for expert guidance or view more exciting Active Play Products Here.